Recently the newspaper has been full of the importance of culture in organisations like ACC. Some cultures are toxic and destroy whole organisations; other cultures are conscious-raising and empowering. There is no doubt that culture is important. According to research by Mike West Aston, Business School UK. (see The Power of Culture Driving Today's Organisations. Management Today Series Australian Institute of Management. ), culture has even more impact on organisational performance than strategy. One hundred organisations evaluated over an 8 year period showed that Strategy attributed 2% to the variance in performance compared to Culture which attributed 17% variance in performance. Culture is the system of attitudes, philosophy, beliefs, and relationships, shared within a group. 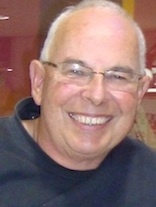 Usually they can be seen in the behaviours and stories of members. These are all transmitted from person to person through observed behaviours and learning. In negative cultures people are more likely to slow down or make errors deliberately, hide from their bosses, put in only minimum effort, take sick leave, resign or look for alternative employment and care less about the customer. Before you say this doesn't apply to me, Gallup research of New Zealand workplaces shows 15% of people are 'actively disengaged' and 68% are 'disengaged.' Only 17% are 'engaged' and this is down from 23% in 2002. Gallup estimates the annual cost of this is NZ$3.67 billion. Another piece of research (by Nicholas Christakis, medical researcher at Harvard Medical School. Published in New Scientist; 1/3/2009, Vol 200, Issue 2688) found that our moods are far more strongly influenced by those around us than we tend to think. Not only that, we are also influenced by the moods of friends of friends, and of friends of friends of friends -- people three degrees of separation away from us who we have never met, but whose disposition can pass through our network like a virus. Indeed it's becoming clear that a whole range of phenomena are transmitted through networks of friends in a way that is not yet entirely understood: happiness, depression, tastes in music and food and even eating, drinking and smoking habits. They ripple through networks "like pebbles thrown into a pond," says Christakis. This is not some minor affect; for example, if a good friend who lives a couple of kilometers away from you suddenly becomes happy, that increases your chances of becoming happy by more than 60%. Contagion affects culture in the same way. Positive cultures become more positive through virtuous cycles of contagion. Negative cultures become more negative through vicious cycles of contagion. As I once heard Mark Blumsky say: "It's not the sad people that I worry about. It's all the people they drag down!" To rate your current culture, work along each of the components in the following table and tick the statement that most closely reflects your current situation. For every tick in the Toxic Zone score a -2, for every tick in the Unaccountable Zone score a -1 and so on; then add up the total score (it should be between -8 and +8). 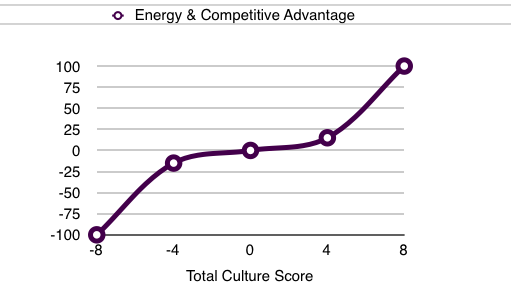 If your total score is less than zero your culture is sucking energy from your organisational system, reducing your competitive advantage and needs to be improved urgently. If your total score is greater than zero your culture is pumping energy into your organisational system and adding to your competitive advantage. The impact of the scores is not a straight line. Energy is sucked out of the system exponentially faster as the score becomes more negative and energy is pumped in to the system exponentially faster as the score becomes more positive. This Strategic Snippet is based on some work I've been doing in the Blue Star Future Project for the Wellington Region. Give me a call if you would like to get involved; it won't be paid but I promise enormous personal growth in thinking, experience and contacts. If you'd like to achieve the 17% additional profit from a stronger culture, give me a call. They don't call me the "Workplace Wizard" for nothing.